GBPA Director Rupert Hayward, past and present Chamber directors, members, friends and family were in attendance to support the new Executives, who were presented their credentials from immediate GBCC Past President, Mick Holding. New Chamber President, Greg Laroda Sr., now the 26th President of the Grand Bahama Chamber of Commerce said it was “a privilege and an honour” to be installed as President. Laroda speaking for his new Executive Board noted that they were all pleased to represent the business community and thanked everyone for the confidence in them, to carry on the business of the organization. He emphasized that community support is important to the work of the Chamber and encouraged persons to assist by volunteering for committees. 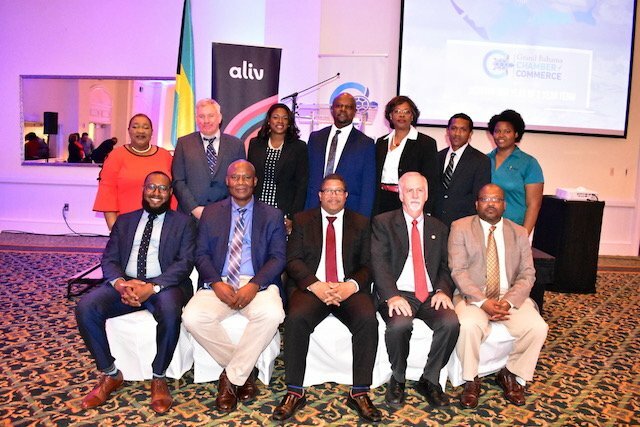 The celebratory atmosphere in the Grand Ballroom of the Lucayan Hotel was filled with food, music, and fun, courtesy of a raffle for fantastic prizes donated by Aliv, and a 50-inch flat screen television donated by Grand Bahama Power. Guests also received giveaways from GBCC. The newly elected officers installed for the 2018/2019 Term are President Greg Laroda of Buckeye Bahamas Hub, 1st Vice President Daniel Lowe of City Associated Enterprises, 2nd Vice President Dan Romance of Bradford Marine, Treasurer Ormand Saunders of Conet Bahamas and Secretary Ralph Hepburn of Underwater Explorers Society. Directors installed are Leslie Davies-Baptista of Paint Fair Ltd, Tax and Economic Research Committee; Lawrence Palmer of Freeport Insurance Agents & Brokers, Small Business Development Committee; Carmel Churchill of Doncar Management, Public Relations Committee; Denis Knowles of Microtech Sales, Industry & Economic Development Committee; Dave McGregor, of Grand Bahama Power Company, Industry & Economic Development Committee; Christine Van de Linde of Grand Bahama Port Authority Ltd, Fundraising Committee and Antoine Brookes of Island Traders Shop & Ship. Serving the second year of a two-year term are Directors Charles Pratt of Grand Bahama Port Authority Ltd, Small Business Development Committee; Kiara Jones of Keys Bahamas Realty and Adrian Carey of Scotiabank. For more information on becoming a member interested persons can visit gbchamber.org, The Grand Bahama Chamber of Commerce on Facebook or visit the office on South Mall Drive. The Chamber will host its monthly luncheon in February. The regular luncheon is held on the last Wednesday every month. Established in 1981, the mission statement of The Grand Bahama Chamber of Commerce is “to provide the network, to sustain, promote and support business development to encourage sustainable growth and expansion in the Grand Bahama economy and within a healthy and clean community environment”. The Chamber’s membership body is comprised of small, medium and large businesses on Grand Bahama who represent the business community on the island. The Grand Bahama Chamber of Commerce strives to protect the interests of businesses through working relationships with the Government of The Bahamas and the Grand Bahama Port Authority.